Esther Ennis was the first interment at Calvary Cemetery in 1848. In the mid-19th century Manhattan was so crowded (by 1845 the island was fully built up south of about 42nd St.) that it was running out of cemetery space. The two largest cemeteries were developed by Trinity Cemetery, in the churchyard adjacent to its ancient Broadway and Wall St. location, and uptown in the furthest reaches of civilized Manhattan territory, the wild north of 155th and Broadway. By the 1840s Brooklyn’s largest cemeteries, Green-Wood and Most Holy Trinity, and Woodlawn in the Bronx were accepting interments; and in Staten Island there was Moravian, developed in the 1760s, and many smaller cemeteries. Queens, too, had dozens of tiny burial grounds scattered around, many dating to the mid-1600s. In 1847 the Rural Cemetery Act was passed, prohibiting any new burial grounds on Manhattan. Presciently anticipating the legislation, trustees of the old St. Patrick’s Cathedral on Mulberry St. in what is today known as Little Italy began buying property in western Queens. Calvary Cemetery, named for the hill where Christ was crucified, opened in 1848. The original acreage had been nearly filled by the late-1860s, so additional surrounding acreage was later purchased to the east. 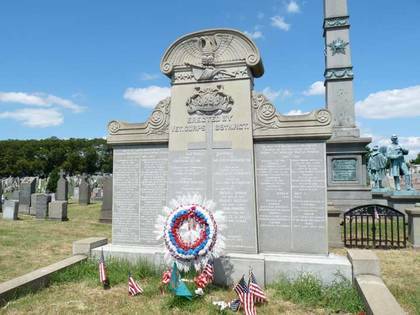 The original Calvary Cemetery lies between the Long Island Expressway (formerly Borden Ave.), Greenpoint Ave. and 37th St., Review Ave. and Laurel Hill Blvd. New Calvary, in three divisions, is west of 58th St. (formerly Betts Ave.) from Queens Blvd. south to 55th Ave. Smaller, pre-existing cemeteries were part of the original acreage, and were then surrounded by Calvary. My usual cemetery of choice for exploration to satisfy my thanatophilia has been Green-Wood in Brooklyn, due to its accessibility. But today’s quarry was Calvary. It’s not a burial park, like Green-Wood or Woodlawn; rather, it was a place where, when you’re dead, to get yourself buried. Despite its no-nonsense quality (original interments cost families $7, and members often dug the graves themselves) Calvary sometimes has a surrealistic atmosphere, with the beetling towers of Manhattan and Queens the backdrop. Among the first gravesites of note you encounter after entering Calvary from its gate at Greenpoint and Gale Aves. is that of Charles Keegan, a Brooklyn firefighter killed while fighting a blaze at Locust Point (the long-lost locale is at Meeker Ave. where it meets Newtown Creek), caused by a lightning strike at the Sone and Fleming Kings County Oil Refinery on 9/15/1882). Explosions associated with the blaze claimed the first Penny Bridge; Keegan and fellow firefighter Stuart Deane suffered grisly deaths, according to the New York Times account. This gravesite is where you find Michael Degnon and his family. After forming the Degnon Construction Company in Cleveland in 1895, Degnon, whose chief line of construction was in railroads, moved his headquarters to New York in 1897. The Degnon Company built many of the IRT’s early subway tunnels in Manhattan and Brooklyn from 1904-1908; the Steinway tunnels originally meant to carry trolley cars but later fitted for subways; what is now known as the PATH tunnel under 6th Ave.; and much of the original Pennsylvania Station. Degnon also built a now-defunct railroad serving several warehouses and businesses in Sunnyside that connected to the nearby Sunnyside railyards, as well as many of the warehouses that are now home to schools and the International Design Center. Some of the Terminal’s early clients were Sunshine Biscuit Company, Packard Automobile Company, American Ever Ready Company, and American Chicle Company. Of course, the rising cost of doing business in New York forced all of these companies to find other cities in which to manufacture, and the Degnon tracks in Sunnyside were defunct by the end of the 1980s. Degnon’s railroad works around the country are also numerous. Joe Howard (1878-1961) was a prolific songwriter in the late-19th and early-20th centuries. While he didn’t rise to the heights of an Irving Berlin or Oscar Hammerstein, he appeared in vaudeville as early as age 11 and wrote dozens of hits and songs in Broadway musicals. Cartoon fans will recognize Michigan J. Frog’s rendition of Howard’s 1899 “Hello Ma’ Baby.” And Joe Howard’s “I Wonder Who’s Kissing Her Now,” written in 1909, has been heard in dozens of versions from Billy Murray to Dean Martin. Other names from showbiz interred in Calvary include Tess Gardella, who played the first Aunt Jemima in 1920s productions of Show Boat, even though she was white; actress/nightclub owner Texas Guinan (“Hello suckers!”; Whoopi Goldberg’s 10 Forward proprietress on Star Trek was named for her) prolific character actors Arthur O’Connell and Joe Spinell, who were in hundreds of TV shows and feature flicks; and Una O’Connor, who screeched and screamed in the James Whale 1930s productions of Frankenstein and The Invisible Man. 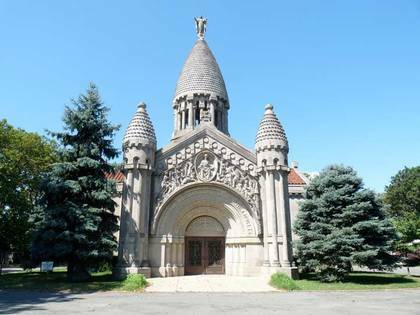 The centerpiece of Calvary Cemetery is its central chapel (Raymond Almirall, 1895) called a “miniature Sacré Coeur beehive tower” by the AIA Guide to New York City; it resembles the Cathedral of the Sacred Heart in Paris. 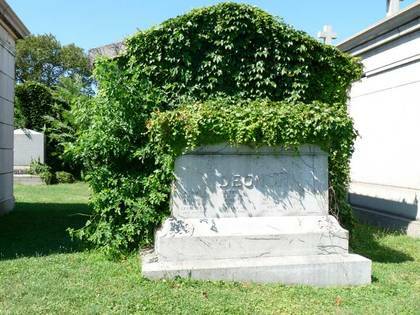 It was also designed as a burial crypt for NYC’s parish priests. 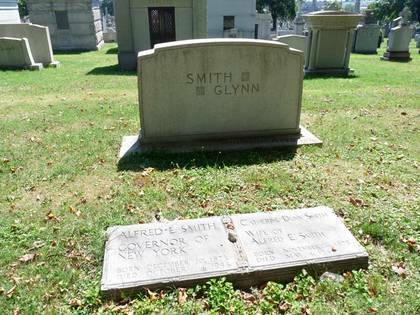 Al Smith (1873-1944) was Governor of New York State for four two-year terms (elected in 1918, 1922, 1924 and 1926) and the unsuccessful Democratic standard bearer in the 1928 Presidential race (he lost to Herbert Hoover, but was the first Roman Catholic major-party candidate). The “Happy Warrior” as FDR nicknamed him, championed laws governing workers’ compensation, women’s pensions, and children and women’s labor. He broke with Roosevelt after the latter’s election in 1932, disagreeing with FDR’s New Deal policies. A protégé of Smith’s was an assistant, Robert Moses, who began building NYC’s parks, parkways and expressways systems in the 1920s. After the 1928 election, Smith became president of Empire State Inc., the governing body in charge of constructing the King Of All Buildings. Other NYC and NYS politicians interred at Calvary include Patrick Jerome “Battle Axe” Gleason, the colorful mayor of Long Island City; High J. Grant, who became NYC mayor at 31, the youngest in history, serving from 1889-1892; and Robert F. Wagner I, II and III, a US Senator (1927-1949), a longtime mayor of NYC (1953-1965) and a deputy mayor and President of the NYC Board of Education, respectively. 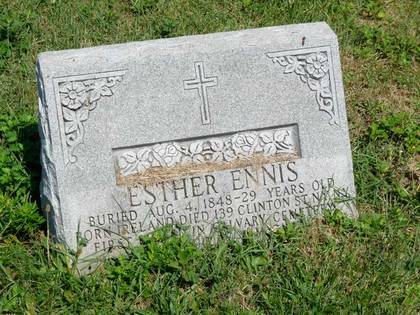 Esther Ennis was the first interment at Calvary Cemetery in 1848. Not much is known of Esther, though according to legend she died “of a broken heart” at 29. This stone was placed over 100 years after her death, judging from the styling. This is not the earliest grave in Calvary, though, as we will see. 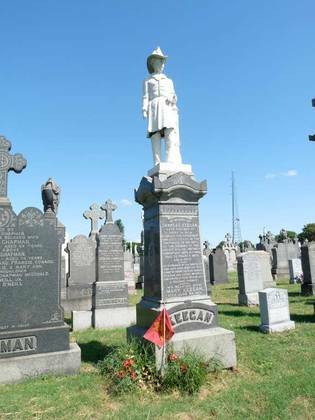 Calvary Cemetery’s Civil War memorial is owned and operated by the NYC Parks Department, explaining the maple leaf Parks sign. It’s the only NYC park completely surrounded by a cemetery. 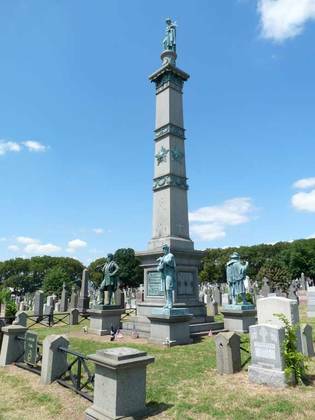 While Green-Wood Cemetery Soldiers’ Monument has been spiffed and polished, Calvary’s copper is resolutely verdigris’ed. The city had purchased the land from Calvary Cemetery from the Trustees of St. Patrick’s Cathedral and gave the Parks Department jurisdiction over it. Twenty-one Catholic soldiers from the Union side are buried here with the last interment occurring in 1909. Four life-size figures of Civil War soldiers stand on the pedestals. The 50-foot granite obelisk, which stands on a 40 x 40 foot plot, originally had a cannon at each corner, and a bronze eagle once perched on a granite pedestal at each corner of the plot. Adjoining the Civil War memorial is another, commemorating the NYC 69th Infantry Regiment(“Fighting 69th”), part of the US National Guard. The regiment, founded in 1849, had a rich history in the Civil War and World Wars I and II. The regiment’s motto was “Gentle when stroked—Fierce when provoked” in reference to the Irish Wolfhounds on its crest and dress cap badges of 1861. To this day the St. Patrick’s Day Parade up the Queen of Avenues is led by the 69th and its wolfhounds. The regiment is still intact and saw action in Iraq in the Gulf War. 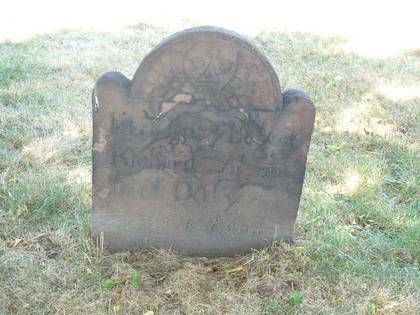 Richard Alsop’s gravestone, dated 1718, is the oldest in Calvary Cemetery, and one of the oldest in New York City. The Alsop family burial site, in a southern corner of Calvary Cemetery in view of the Kosciuszko Bridge, pre-existed Calvary by over a century and was simply incorporated into a Calvary when the land was purchased by St. Patrick’s. In nearby Mount Zion Cemetery, you’ll find the equally old Betts family cemetery. 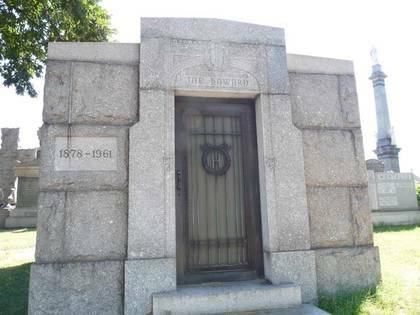 Other unusual cemetery placements are the Drake Park cemetery in Hunts Point, Bronx, and the Quaker cemetery in Prospect Park where Montgomery Clift was laid to rest. Richard Alsop was bequeathed the land by his cousin, British immigrant Thomas Wandell. Several members of the Alsop family were interred here between 1718 and the late-1880s, as well as the family’s slaves, whose graves are unmarked. The family was prominent in Newtown, and married into the Fish and King families, which produced a NYS Governor and 1816 Presidential candidate Rufus King, whose mansion stands in Jamaica. The last of the Alsops died in the 1880s. For more on Calvary, Mitch Waxman’s Newtown Pentacle is a virtual encyclopedia.